… get to know a different country, without getting caught up in stereotypical notions. ...venture out into the extraordinary interior of the country, crossing through Castile and Aragón until reaching a nice warm Mediterranean beach, on the Valencia coast. ... travel safely and enjoy the journey, regardless of whether you choose to walk, travel by car or ride a bike. ...travel across more than 70 natural spaces and lots of quiet and peaceful towns, experiencing their extraordinary cultural and artistic heritage. ...learn about Spain’s medieval history through one of the country’s most famous national heroes: El Cid Campeador. ...enjoy its traditional festivals and customs in a festive and relaxed environment. ...taste the diversity and richness of the Spanish food, combining traditional and modern dishes. ...Then check the information under “Travel info”. What the Way of el Cid (Camino del Cid) is. 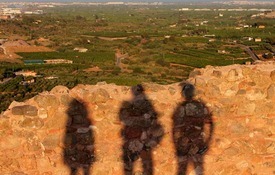 Who we are: Do you now that we are a non profit public institution member of Cultural routes of Spain? The way you can travel along the Way of el Cid: the hiking routes, routes on mtb bikes, road cycling tourism routes, routes by, car, motorbike and motorhomes. Signposting in the Way of El Cid. How to get accommodation deals while travelling around Spain: the Letter of Safe-Passage, the passport in the Camino del Cid route. A Photo gallery for introducing yourself to the Way of el Cid. 'In the Footsteps of El Cid', the first Australian Camino del Cid travel book: a very useful guide for walkers!